The non-refundable fee for applying is $35. NOTICE: The application fee is due at the time you fill out the online application and accept the terms and conditions. You will be able to check your application after you have set it up in the system. This feature enables you to access your application as it will appear to the judges and: 1) edit the copy submitted up until October 15, 2018; 2) verify that your payment has been received. 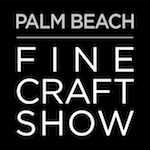 (if it hasn't, please call the Palm Beach Fine Craft Show office at (561) 832-0480; 3) find the result of the jurying process.